The Cregger Center was opened in the summer of 2017. This state of the art facility along with Kerr Stadium is on par with any facility in the country across all NCAA Divisions. ​Kerr Stadium is home to the men’s and women’s soccer, field hockey, and the men’s and women’s lacrosse programs. With seating for 1,400 fans, Kerr Stadium features Field Turf and Lights for the best synthetic surface available. 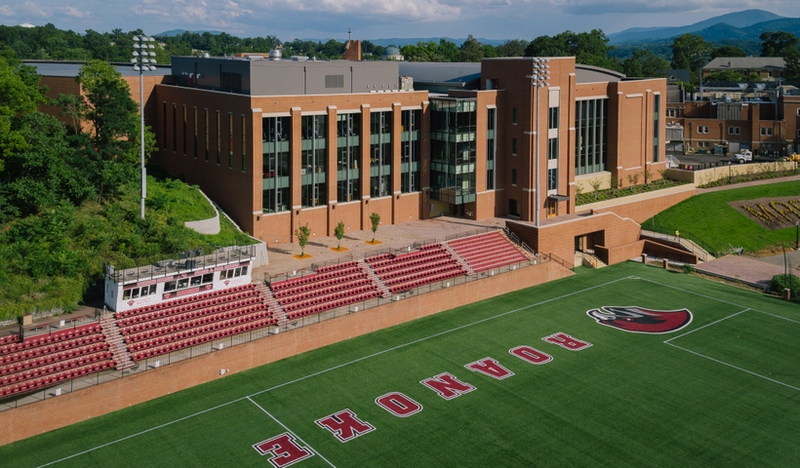 The lights are on six days per week until 10:30 pm, providing intercollegiate, intramural, club and recreational opportunities for all Roanoke College students. With lights available, practices along with the fields on the Elizabeth Campus for outdoor teams can be more flexible. Kerr Stadium, which is considered one of the finest outdoor facilities in Div. III, was the host for the NCAA Division II & III Women’s Lacrosse Championships in 2009. They hosted the NCAA Div. III Women's Lacrosse Championship in 2008 as well. In only three years of existence (since spring of 2007), the field has been the host of 13 ODAC Tournament games, including three ODAC Championship and five NCAA Tournament games. Take exit 140. Turn right onto Thompson Memorial Highway. Follow for two miles to second stop light (Main St.). Turn right onto Main St. Take Main to second light (Market St.). Turn right onto Market St. Follow Market St. for 200 yards. Bast Center will be on the right. Kerr Stadium is behind Bast Center.